Fri, 14 Jan 2011 | Published in I Was There . . .
Just when everyone thought 2010 was nearly through, on Wednesday, December 29th, an unlikely pair of artists took to the stage to merge two very different genres of music. 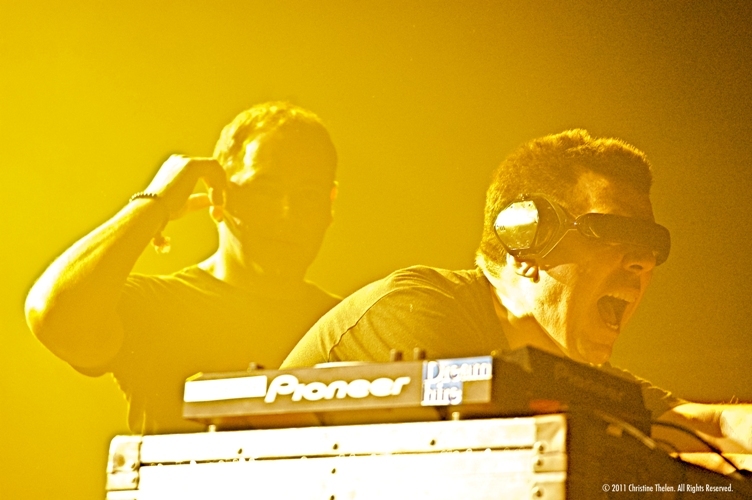 The Crystal Method warmed up everyone at Terminal 5 that night more than all other headliners can and will do. Even though their wild electronic beats were coming through speakers earlier than they’re probably used to playing, there was no shortage of fist-pumping or colorful chants. DJs Scott Kirkland and Ken Jordan continually shot their fists into the air and interacted heavily with the audience as they played many great hits, including some off their recent EP Sine Language; the added benefit of this group opening was that such an early set made the floor very available and thus highly danceable. Amidst the fist pumping and screaming, both Kirkland and Jordan also managed to communicate a sweet humility and appreciation for being able to play in New York that night. DJ Scott Kirkland put everyone on the same level by taking photos of the audience with his own digital camera as many took photos of them. Following the all-too-short Crystal Method set, the number of fans in the audience seemed to quadruple almost instantaneously as the famous trailblazers of “trance-fusion,” the Disco Biscuits took the stage. 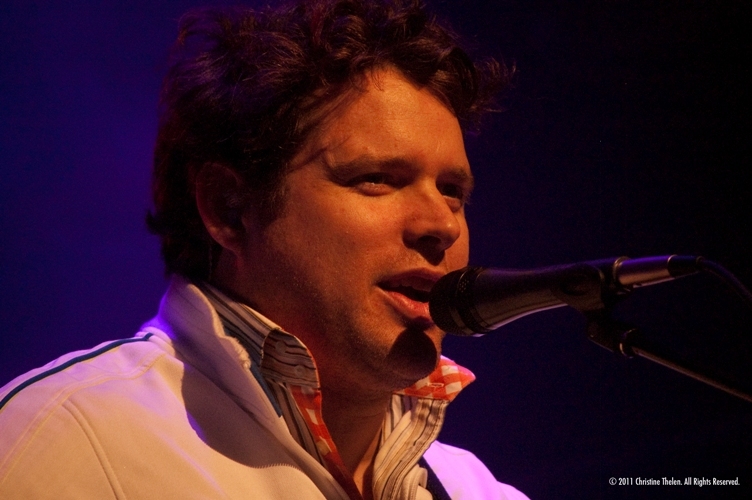 Although drummer Allen Aucoin couldn’t play that night, the band welcomed an old friend, Dr. Sam Altman to the stage as Allen’s temporary replacement. 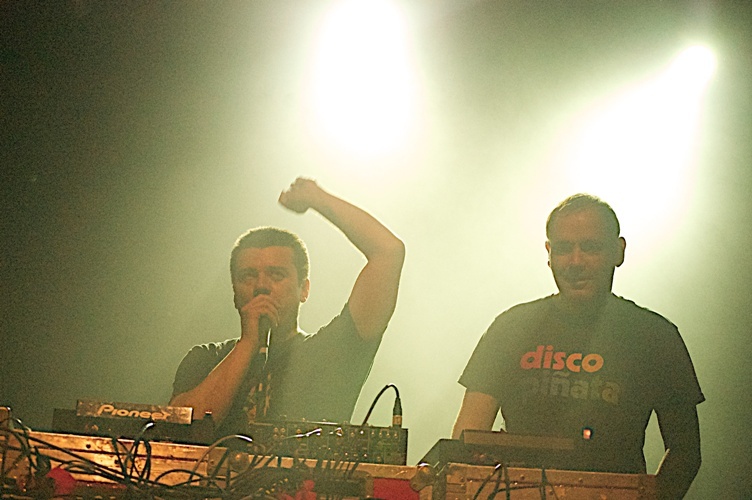 Whereas the Crystal Method’s songs were comparably shorter spurts of higher amounts of electronic energy, the Disco Biscuits carried out their songs and interweaved them so that the entire first set was something more along the lines of a composition in several parts, rather than a collection of individual songs. They played for what seemed like hours, then they took an intermission, only to come back later for even more shiny happy fun. Perhaps it did make sense to pair these two strong and remarkably different artists together after all, as both dabble in electronic music in entirely different ways.